We were using a Garmin GPS with “VELOMAPS” installed as a base map. It was marvelous at avoiding all the major routes around Caen, there was one unsurfaced track across farmland which did make us start to wonder, but we made good time and arrived in Ouisterham in time for lunch on the sea front in a restaurant called: L’Arrogance, which was attached to a mini-golf course, they provided a very nice, welcome meal. We had decided to spend the money we would have paid for a cabin on the overnight crossing OR hotel in Portsmouth on an hotel in Ouisterham and travel on the early morning boat to make the connection with the pre-booked train section of the journey to John O’Groats. 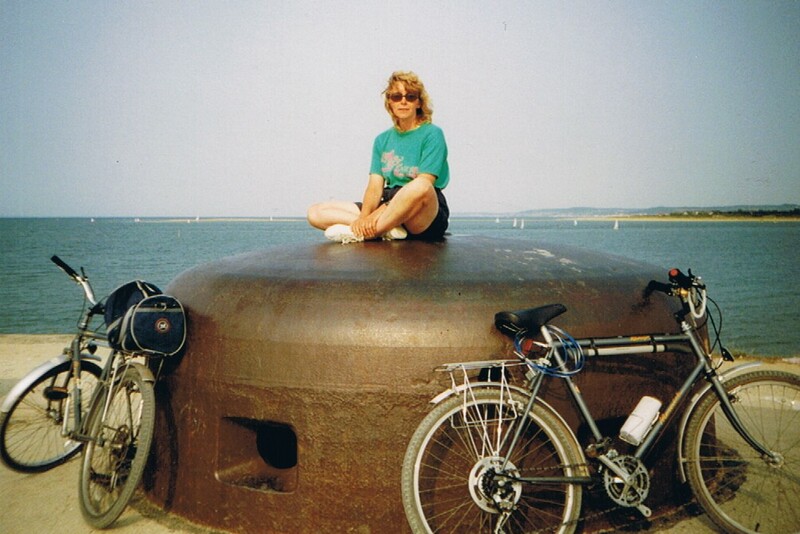 So we checked in to the hotel and then went on a ‘ride-about’ – amusing ourselves by trying to reproduce a photo I took of Janet sitting on a gun turret, nearly 30 years ago, the last time we cycled in Ouisterham. – can’t be 30 years! The ferry crossing was a good time for us to relax, we had breakfast and lunch on board, it was a smooth crossing and we arrived in Portsmouth on time. Now the anticipation got close to panic, up to today we had never taken our bikes on a train. We cannot help it, but we are the sort of people who like to know what is coming next and prepare as much as we can (thinks…strange – it seems as though we like cycle touring for the unexpected things we encounter?) To make things worse our GPS played up, I know Portsmouth, but I did not know the cycle route from the Ferry port to the Harbour station so I wanted to test the cycleway mapping – it led us some of the way, then seemed to abandon us in the middle of a busy interchange where sense of direction played no useful part as it was necessary to find underpasses and crossings that were not even in the direction we wanted to go! Anyway, using brute force, ignorance, and climbing around barriers we arrived at the station. Here things went smoothly: obtaining tickets, polite friendly staff, easy platform access meant we were soon sitting comfortably and on our way to Waterloo, comforted by the knowledge that being a terminus, we would not have to unload the bikes in a hurry before the train moved on. If we thought Portsmouth was bad, London was a nightmare – ok, it was an interesting and with hindsight, enjoyable nightmare, but at the time: Janet went into panic mode, she would not ride her bike from Waterloo, surprisingly it was not the motorised traffic but the other cyclists that presented the biggest problem, for us it seemed more like we had arrived in Beijing rather than London – cyclists of all varieties were zipping in every direction, all it seemed, being able to ride faster than us! We started to walk with the bikes, on the pavement, not easy at this time but I feared we were approaching ‘rush hour’ and then it would be impossible. 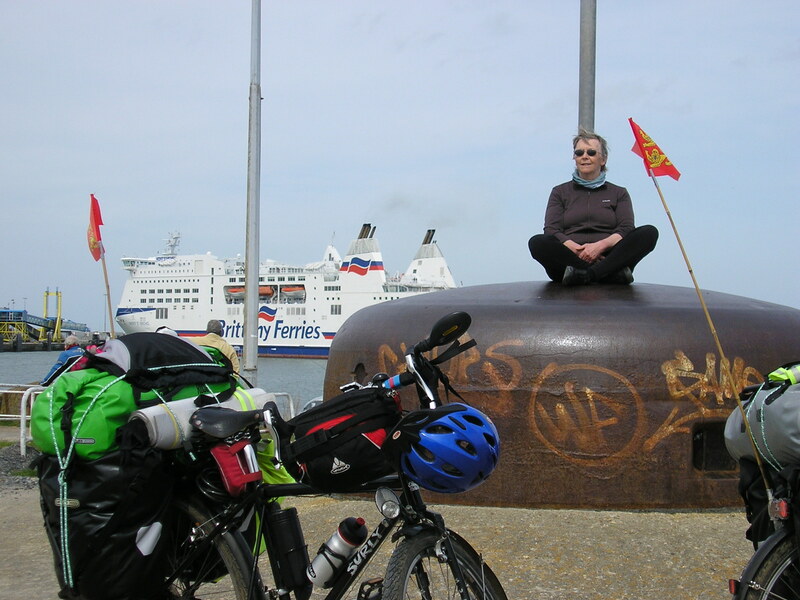 We were halfway across Waterloo Bridge when a lady cyclist from New Zealand stopped, initially to talk about our bikes and where we were going but she was very good at giving Janet a bit of confidence and eventually we were able to mount up and ride the rest of the way to Euston. Amusingly, while travelling along with a lot of other bikes on a dedicated cycle section, the Normandy flags we were flying from our panniers were recognised by a Frenchman who, understandably, cycled up behind Janet and started talking in French! Small world, it turned out he was from Vire, only 30kms from our home. We had scheduled plenty of time to arrive at Euston so we enjoyed a relaxed time at the outside pavement cafes while we waited to board the next train of our journey, the overnight sleeper train to Inverness. First we did have to retrieve our tickets for the rest of the trip from the machine, it amazed us that with tickets for the bikes, tickets for our bunks we ended up with no less than 23 – that included the one that detailed the other 22! Lucky the machine did not run out of ink, I know my home one would have! The mist had hardened to that fine rain that seems to make you wetter than other types by the time we reached Thurso. Oh well, get kitted up in the wet weather gear – there is only about 12kms to cycle to our hotel in Castletown – that is only the length of our ‘bread run’ at home.. Cycling out of Thurso was not too bad, apart from the fact it was ‘school run’ time – we were soon at the junction that left the main road to follow National Cycle Route 1 to Castletown. I knew it was going to be a hill, but what I had not allowed for when playing the ride through my mind, was this now torrential rain AND near gale force head wind. I told Janet to tuck in behind me and said I would go very slowly…. it seemed a long way, but after about 200 metres I realised I could no longer see Janet in my mirror (actually I could see very little anyway – the problem with cycling in rain with glasses!) I stopped to wait for her, as she was now walking. It was very distressing, she was in floods of tears: “I can’t do it, I can’t go on” – I admit to being a little surprised, Janet has followed, no, accompanied me on practically all my, sometimes masochistic, adventures over more than 40 years and I had never seen her as beaten as this. I had to take a deep breath and try to stop myself saying one of my usual less than sympathetic comments as I knew this time it would probably mean divorce, not a good end to an adventure that had not yet actually started! We walked together to the top of the hill, by which time she had recovered just enough to try again. I realised I would have to keep the words of encouragement coming and make sure I did not let her drop off my back wheel, because by now I knew that I would not be able to do the ride without her. It took just over an hour to reach the hotel, although it seemed much, much longer, we were checked in easily by very friendly staff and our bikes were allowed into a plush, carpeted conference room with some bin bags to catch the drips! It then stopped raining!